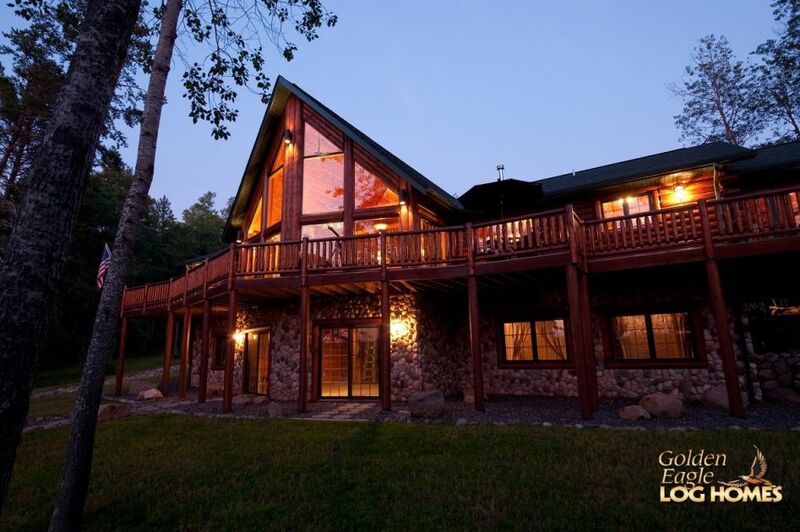 After a tiring day hiking in the mountains, kayaking along a river or exploring the woodlands, there is no feeling like returning to a relax in a log home. 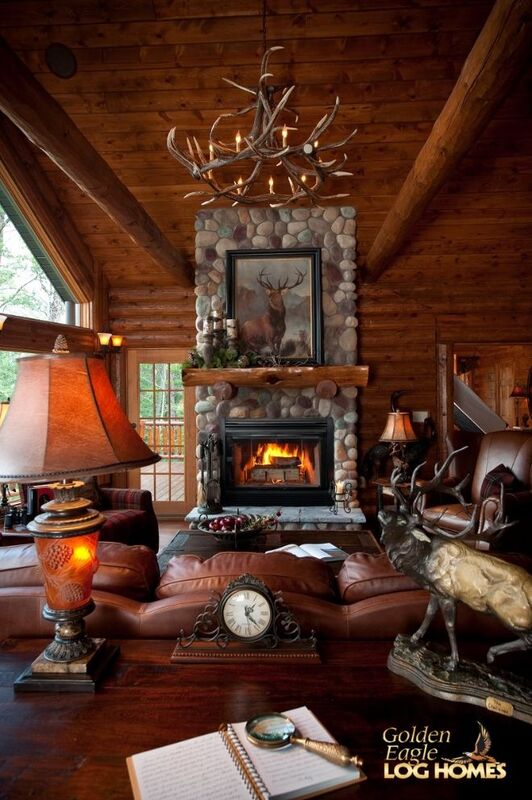 The fatigue of a full day in nature can often illicit the most satisfyingly relaxing evenings, and what better place to do this than in the heart of a home: the great room. Arguably the most important part of the house, the great room is where your party of family and friends will gather to relax, chat and laugh. In recent years, log home design has realized an increasingly popular style which features a 'prow' - or a pointed front. As we look at the front of this 1,842-square-feet beauty, our eyes are immediately drawn to the soaring wall of glass which makes up the "prow." 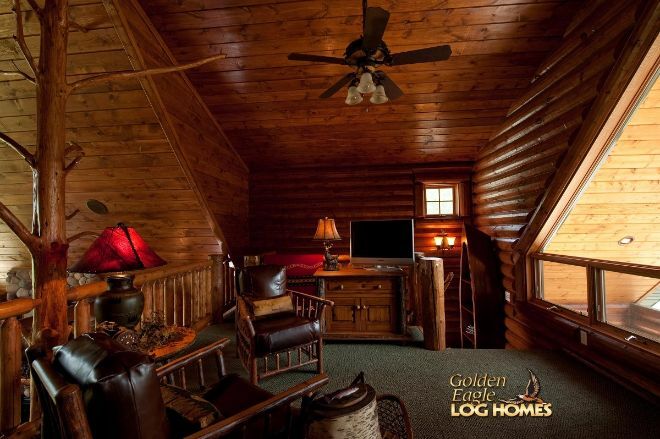 The Eagle Prow V looks vibrant and alive in comparison to more traditional style log homes. 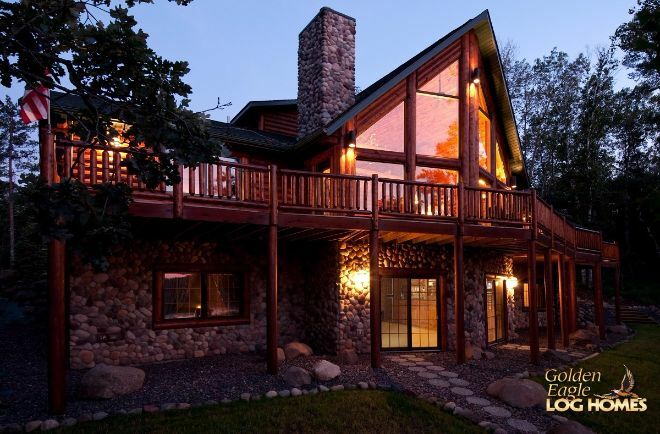 This attractive design doesn't only look great from the exterior, it creates the perfect living space within. The incredible floor-to-ceiling windows of the prow allow an abundance of natural light to flood the house. The jutted point acts to draw the light in and creates a different feel to the typical flat wall of windows. The soaring vaulted ceilings and hardwood floors are finished in richer, darker tones. The light from the windows is so bountiful, there is no fear of creating a dark space. At night, the attractive stone fireplace becomes the focal point of the great room, creating an inviting and cozy space to relax. Moving from the great room, we pass through a generous dining room which can easily host a large party for dinner. 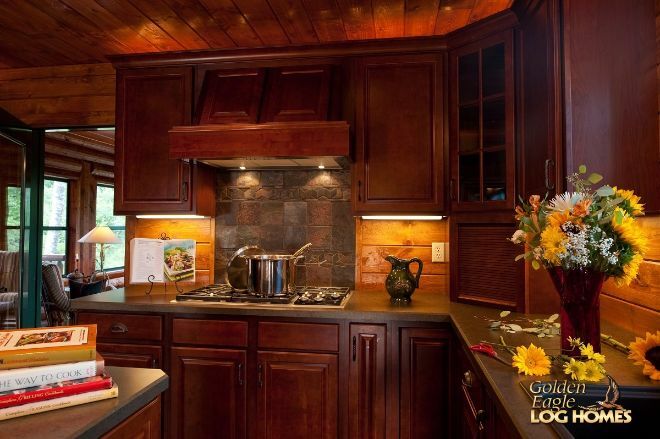 The kitchen in Eagle Prow V is spacious and has plenty of counter top space. The attractive stone island is a welcomed contrast to the wood and creates a centerpiece in the room. 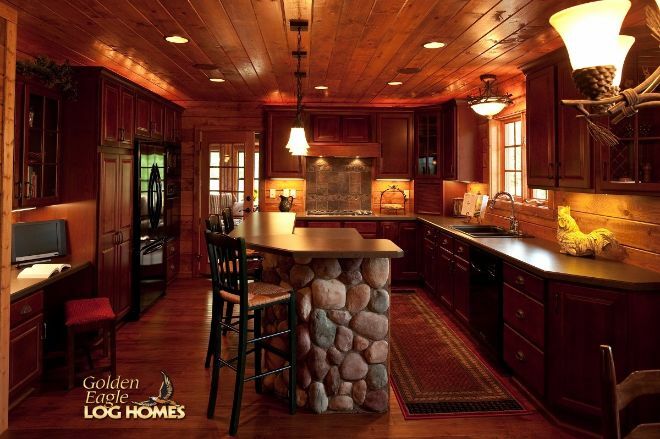 The dark wood cabinets are a tasteful addition, giving the feel of a country kitchen. Modern appliances ensure the kitchen is as functional as it is attractive. 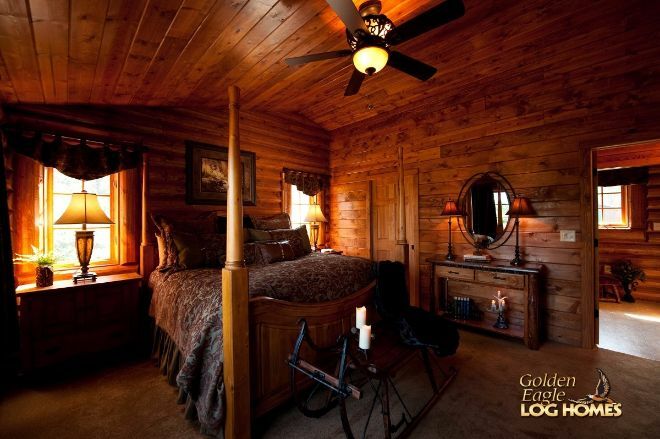 The bedrooms in Eagle Prow V are both located on the ground floor. The master bedroom is generously sizeable and features an en-suite bathroom. Numerous windows mean the bedroom is light during the day, whilst the dark tones of the wood make it a cozy space at night. 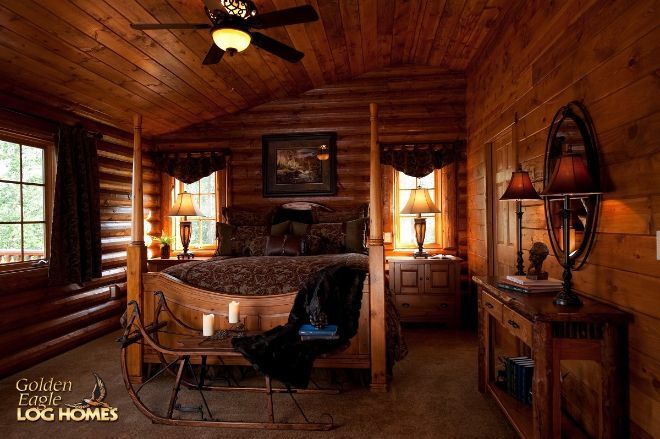 In the model pictured, the second bedroom has been customized into an all-seasons room. 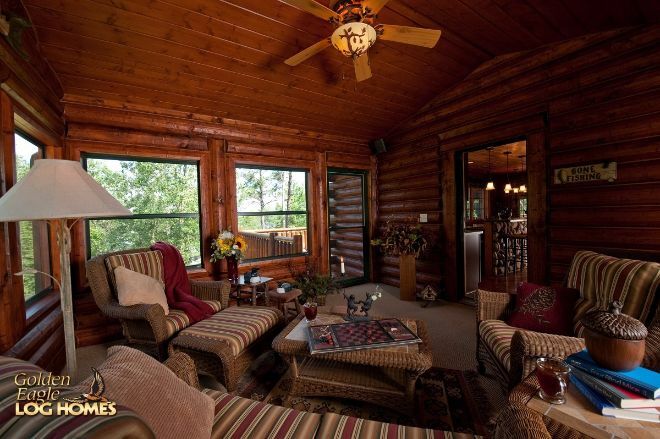 It offers a quiet alternative space for those who prefer to relax and enjoy the scenic views. The loft can be customized as a third bedroom depending on the owner's individual requirements. 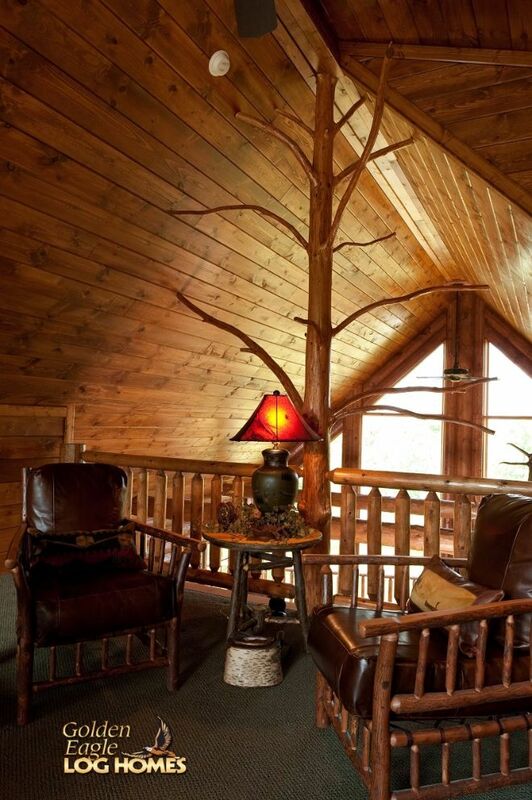 It would make the perfect home office or alternative sitting space. With natural light from the front and the rear of the house, this airy loft offers ultimate relaxation. 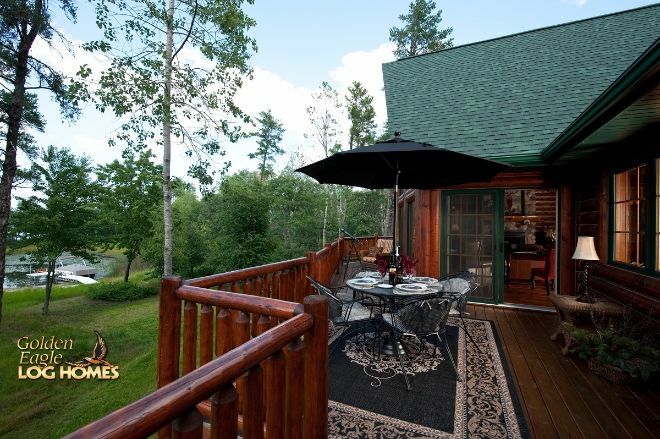 The wide deck which runs along the front of the house is ideal for enjoying your perfect view. 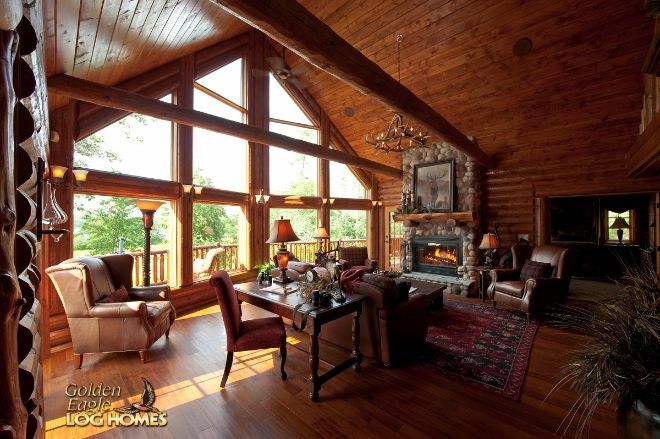 Do you like the "prow" great room? 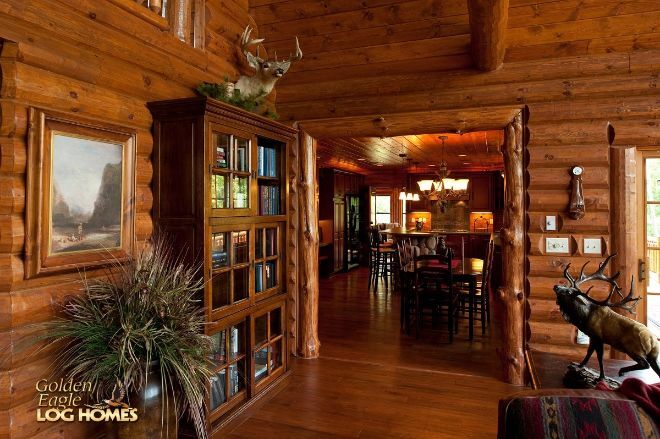 Like and Share to show your love of log homes! Surrounded by impossibly green foliage, one can find this tranquil Scandinavian-style cabin. 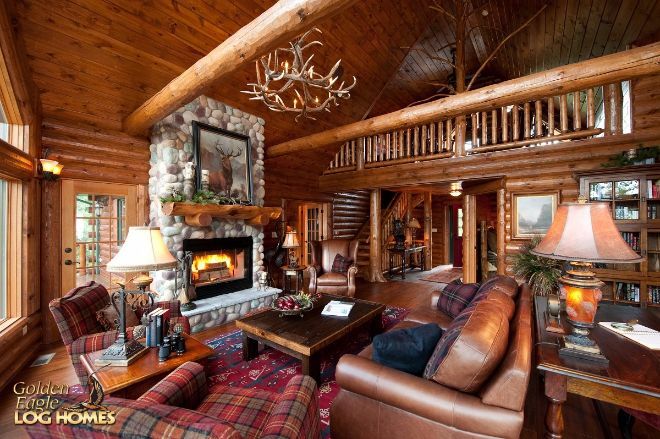 Don't let its rustic exterior fool you — the owners have seamlessly melded antique pieces and modern amenities for a truly unique aesthetic.